This month we have focussed on the Great British Staycation, bringing you all the info you need to make the most of a holiday in the UK. Last week we shared our top UK destinations, but this week we bring you the very best activity breaks available for families! Forest Holidays have a multitude of fun-packed locations across the UK to offer a convenient option for families of any area. There is a selection of cabin types to choose from, with the added option of luxuries such as hot tubs and log burners, and plenty of locations also welcome animals to come along and enjoy the holiday too! Activities are available to suit all ages, abilities, and adrenaline ranges, with things to do such as hiking, cycling, archery, kayaking, motorsports, fishing and even cliff jumping! If you’re looking to have fun and gain an adventure without the fuss of going abroad, Forest holidays offer packages that are perfect for your needs. The British countryside is famed for being inspiringly picturesque, and what better way to enjoy those fantastic views than to get right in amongst them! GoActive has accommodation dotted all over the UK so finding your nearest one should be no trouble at all. All of the activities at GoActive are led by experienced professionals and cater for people of all ages and abilities, so you can be sure that your holiday is going to be fuss-free and safe. A multitude of fun-packed activities are available including sailing, horse riding, 4×4 safari, snorkelling, pilates, paintball, abseiling, water parks, zorbing, circus workshops and golf. The list of things to do seems never-ending, and you’ll have plenty to keep you occupied from morning until night. 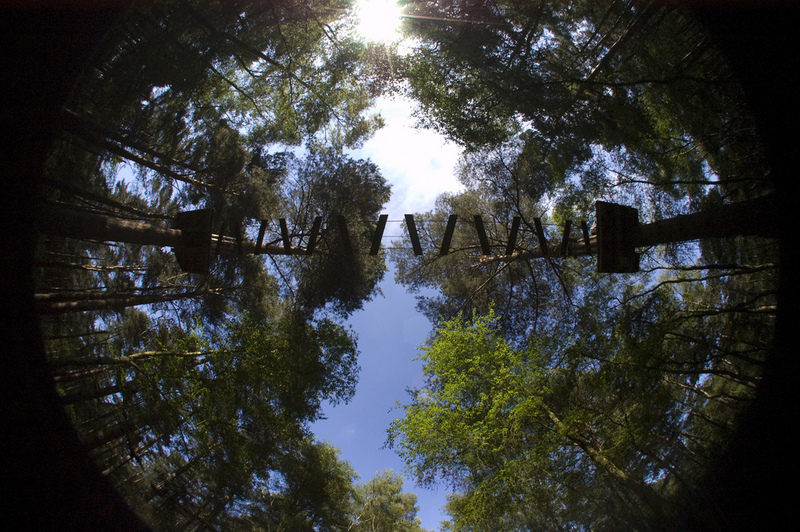 Go Ape is the UK’s number one forest adventure, and makes for an exhilarating day out for the whole family. Swing from the treetops on an adrenaline-inducing course of ropes and wires through the forest to get to the other side. You’ll get the chance to take in some fantastic scenery, have a lot of fun, and make memories you’ll laugh about for a lifetime. Separated into ‘gorillas’, ‘baboons’, and ‘tarzans’, all abilities are welcome and there are trained staff on hand at every point to ensure your safety and security. If some of the family don’t quite feel up to the task, there are Segway rides that can be taken around the forest floor, for a buzz without any worry. Go Ape has 29 locations across the UK, so finding one locally shouldn’t be too much of a problem. If adrenaline is what you’re looking for, Extreme Element is your answer! One of the benefits of choosing to spend your family holiday in the UK is that you save yourself money in travel and overseas accommodation, so why not put that saved money to good use by booking some exhilarating activities? Whether you stay at home, rent a house or holiday home elsewhere or decide that a trip in the campervan is the way forward for your family, be sure to have lots of activities planned to keep you occupied. Extreme Element is a website that offers near enough every hair-raising pastime you can imagine, from skydiving to hot-air ballooning to white water rafting. There are locations for these activities all over the UK, so you can find yourself having fun right on your doorstep. If some of the family would rather keep it low-key, there are plenty of things on offer from Extreme Element that cater for the slightly less adventurous. Flight simulations, martial arts, scuba diving and quad biking all offer the chance to make memories without worrying about parachutes and life vests! Whatever imaginative activities you choose to occupy yourself with this holiday, make sure you always feel safe. Having trained members of staff on hand will reassure you if you’re worried, and all of the necessary equipment will be available for purchase, hire, or free use so you can feel as confident as possible when trying new things. For added peace of mind, check that your travel insurance covers you for all the activities you want to do and travel arrangements and bookings you have made. Happy holidays, and enjoy your adventure! This entry was posted in Single Trip Travel Insurance, The places we've been on January 23, 2014 by worldwideinsure.